Ghost frontman Papa Emeritus has officially unmasked himself as musician Tobias Forge during a radio interview with Swedish radio channel P1. Forge – who founded Ghost in Linköping, Sweden in 2006 – has long been suspected as the group’s singer alongside a rotating band of Nameless Ghouls. Several former members revealed their identities in a lawsuit filed earlier this year against the singer in a dispute over financial issues, ahead of Forge doing the same on the August 17 edition of “Sommar i P1." The Swedish branch of Ghost’s record label, Polydor, released an unmasked photo of Forge in sync with his radio appearance, where he shared the story of growing up in Linköping and discovering music while idolizing his older brother Sebastian, who passed away from heart failure in 2009 – the day after Ghost posted its first song on MySpace. In that moment, Forge discovered a sense of purpose that would propel his efforts to make Ghost a reality and his late brother proud. “Despite that fact that I don't necessarily feel myself in any kind of belief, it's hard to not see anything religious in the timing,” he continued. “It feels like I've been part of some cosmic exchange deal, where I didn't before hand know that I was part of, but now had done a deal… It felt like if I'd received a huge gift as a comfort from the loss. “And Sebastian, it was as if he still was just a phone call away and could encourage the whole thing and share this with me. I could hear his voice beside me, which communicated and said, ‘Let's rock. The train is on the station and about to go, now.. It goes now! Take the chance now, when you've finally gotten it!’ And I did so, I did it so hard, and I didn't stop. A full English translation of Forge’s radio broadcast can be found on Reddit and you can hear audio of the P1 interview here. 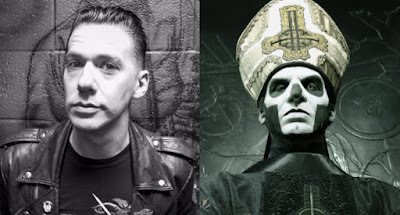 On the road in support of their 2016 EP “Popestar”, Ghost completed a summer North American tour with Iron Maiden and recently performed at Belgium’s Alcatraz Metal Festival and the UK’s Bloodstock Open Air event.